TV is often only as compelling as it is confounding. Westworld, Game of Thrones, Mr. Robot -- you name the prestige drama and odds are it's willfully disorienting and designed to feed the massive message-board ecosystem that thrives on decoding hidden meanings and de-shelling Easter eggs. None of which does any service for the throngs of viewers watching at face value without signing up for a virtual community of critical sleuths. 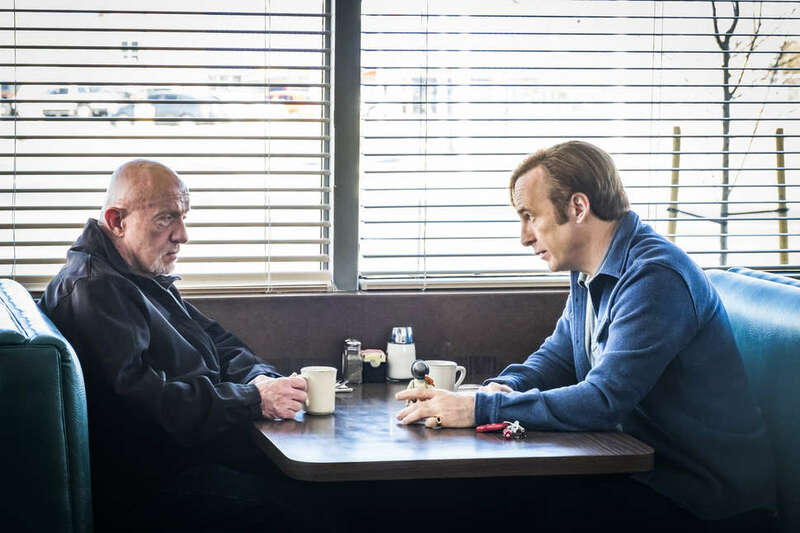 Refreshingly, AMC's Better Call Saul (which returns for its fourth season on August 6, at 9pm ET) and its parent series, Breaking Bad, are each minor epics that, necessary flashbacks notwithstanding, chart a very deliberate and mostly linear course. Still, when viewed as being part of a single, larger franchise (which they very much are), BCS and BB attract their own cult of forensic analysts looking for any clues that offer the rush of continuity, a compliment to how successfully series creators Vince Gilligan and Peter Gould have teased out anticipation for when the two shows overlap. 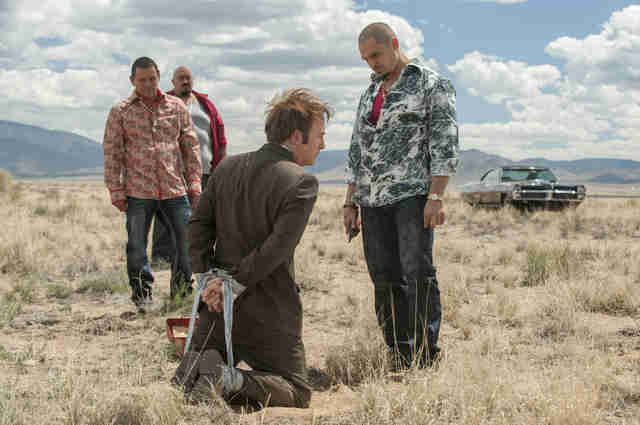 For a handy reference sheet to how the events of Better Call Saul fit relative to Breaking Bad, we've put together this broad, selective timeline of plot points across the two series (according to the show's real-time perspectives), starting with our introduction to Saul Goodman, aka Jimmy McGill, in the Season 1 premiere, and continuing to our most recent sighting of him as the mustachioed Gene, collapsed on the floor of the Omaha Cinnabon where he works. We'll be sure to fill in any important gaps and ambiguities as Season 4 -- and hopefully subsequent ones -- move forward. Or backward. Or sideways. Whichever. Jimmy McGill, a public defender in Albuquerque, pleads his best case on behalf of college-age boys who violated a dead body the previous October (happy Halloween!). On his way out of the court complex, he meets surly parking lot attendant and future "fixer" Mike Ehrmantraut. A hare-brained scam runs Jimmy afoul of violent cartel member Tuco Salamanca, which leads to a fateful meeting with Tuco's associate, Nacho Varga, who ostensibly retains Jimmy for assistance in gang-related legal matters. With funds procured from a bribe by embezzling potential clients the Kettlemans, Jimmy starts his own elder-law practice -- with garish billboards, corny local ads and all -- in an effort to come out from the shadow of his successful and respected older brother Chuck and the influential law firm he co-founded, HHM. (Chuck, while brilliant, is housebound with a possibly psychosomatic allergy to electromagnetic fields, and Jimmy, despite their differences, more or less tends to Chuck's daily needs, such as bringing in the newspaper.) Soon, Jimmy discovers that retirement home Sandpiper Crossing has been exploiting its residents and lands his first big case. Mike, a former Philadephia police officer, is taken in for questioning about the deaths of Mike's son and two corrupt cops back east. He asks Jimmy to help him out; in return, Mike helps Jimmy squirm out of the Kettlemans' mess. Chuck, energized by helping Jimmy with the Sandpiper case, steps outside without suffering an EMF-sensitivity attack, to both his and Jimmy's amazement. Jimmy and his on-again/off-again love interest and sometime colleague Kim, then an associate at HHM, come to realize that Chuck has handed the Sandpiper case to HHM for a payout and assurance that Jimmy won't work on the case. While Jimmy is reliving his glory days in Chicago with fellow small-time crook Marco, Marco dies of a heart attack. Upon returning home, Jimmy visits Mike and expresses regret for not pocketing the Kettlemans' stolen loot and vows to stop being a pushover. After a night of drinking and pranking a dopey businessman, Kim and Jimmy get back together romantically. At Kim's urging, Jimmy takes a cushy job at powerhouse law firm Davis & Main. Jimmy dumps his trademark rusted-out Suzuki Esteem for a top-flight Mercedes sedan. Chuck rattles Jimmy by appearing at HHM's offices as Jimmy represents Sandpiper's plaintiffs on behalf of Davis & Main. Jimmy films a rogue TV ad promoting Davis & Main's elder-law services to lure in plaintiffs for the Sandpiper case and shows it to Kim. Jimmy places the ad and his boss finds out. Both of them get in trouble with their respective employers. Nacho and Mike conspire to kill Tuco, but Mike reconsiders, instead goading Tuco into beating him up so that he'll be arrested. Kim, still working for HHM, is introduced to Kevin and Page from Mesa Verde Bank, which is hoping to expand their regional operations. Chuck tells Kim that Jimmy siphoned their dad's earnings as a kid, leading to his early death. Hector Salamanca, Tuco's uncle and key cartel henchman, introduces himself to Mike at the local diner and encourages him to change his tune with police about Tuco's assault. Leonel and Marco, the terrifying twin brothers later seen in Breaking Bad, threaten Mike's granddaughter's life, leading to a sit-down and settlement with Hector. The Schweikart & Cokley law offices, impressed with Kim's Sandpiper defense, sets out to poach her from HHM. Meanwhile, Jimmy does everything he can think of to force Davis & Main to fire him. Jimmy and Kim decide to branch out on their own and share an office housing their individual practices. Chuck steals Mesa Verde out from under Kim. Jimmy, in turn, steals Chuck's Mesa files and corrupts them with tiny errors, which leads to his humiliation in court and Kim winning Mesa back. Chuck, convinced Jimmy falsified the Mesa Verde files, heads to the copy shop to interrogate an employee who was working when Jimmy created the bogus paperwork, but has an EMF attack and lands in the hospital. Back at home, he tricks Jimmy into confessing to his crime and captures it on tape. 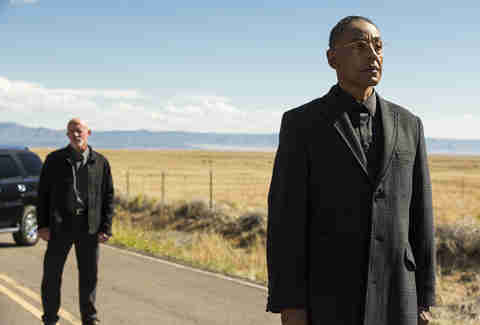 An enigmatic figure (read: Gus Fring) wards Mike off from assassinating Hector. Jimmy hires Francesca as Wexler McGill's receptionist. She would remain his receptionist up through the end of Saul Goodman's story in Breaking Bad. Jimmy and Kim discover that Chuck has a tape of Jimmy confessing to fudging the Mesa Verde documents. Jimmy breaks into Chuck's house in a rage and gets arrested. Hector and crew confront Gus at Los Pollos Hermanos, essentially starting a war. Gus officially hires Mike. Meanwhile, Jimmy confesses to his crime, risking disbarment, but also has Mike spy on Chuck so they have evidence of his delusional state. Said evidence includes a foreshadowing photo of Chuck's lantern on top of the Financial Times. Jimmy wins, but gets suspended from practicing law for a year. He resorts to directing local commercials to cover Wexler McGill's overhead -- under the name Saul Goodman. Kim gives Howard Hamlin, one of HHM's partners, a check covering her law-school loans so they're officially disentangled. Chuck, after a therapy session, goes grocery shopping without completely breaking down. Gus hooks Mike up with Lydia, who employs him on the books with Madrigal. The cartel boss, Don Eladio, orders Hector to more or less run his business through Gus. Howard compels Chuck to retire, but Chuck sues HHM for breach of contract. Kim stretches herself too thin, gets in a bad car accident, and takes time off to rediscover herself and watch lots of bad movies. Howard buys out Chuck's share of HHM from his own pocket. Jimmy outs himself as a con man to the Sandpiper ladies, ensuring he won't see his share of the settlement any time soon, and the Wexler McGill office closes. Thanks to Nacho's amateur chemistry and sleight of hand, Hector has a stroke during a meeting with Gus. Chuck disavows Jimmy, unravels, and tears his entire house apart, essentially killing himself by kicking over the gas lantern sitting on the Financial Times and setting the house ablaze. Chemistry teacher Walter White learns he has cancer and, after seeing former student-turned-junkie Jesse Pinkman while accompanying his brother-in-law Hank Schrader on a DEA drug bust, he begins making and distributing meth to leave money behind for his family. When one of their dealers gets arrested, Walter and Jesse hire an attorney: Saul Goodman. Walter White conspires with Hector Salamanca to literally blow Gus Fring to bits. 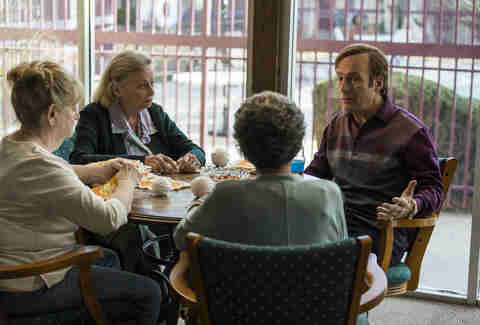 Saul uses a mysterious connection named Ed to disappear him and give him a new identity (Walter also takes advantage of Ed's services, albeit not permanently). "If I'm lucky, a month from now, best-case scenario, I'm managing a Cinnabon in Omaha," Saul memorably imparts. Walter White emerges from isolation, mows down his remaining ties to criminality, frees Jesse, ensures his family will be solvent, and dies. 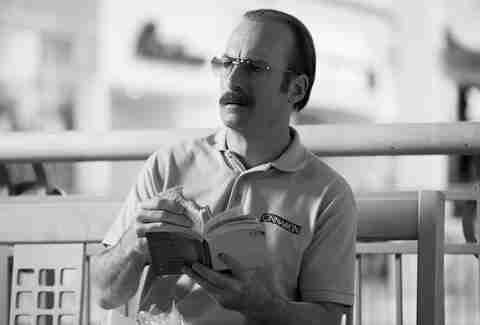 Several black-and-white flashbacks illustrate that Saul’s best-case scenario has become a reality. More than one shot of a state seal bearing the date of Omaha’s incorporation (1857) and the city's celebration of its 200th anniversary indicate that nearly 50 years have passed since Saul was spirited away from Albuquerque to take on the identity of Cinnabon-employed Gene. (Before you point out that Jimmy McGill, born circa 1962, would be roughly 95 years of age in 2057, bear in mind that BCS/BB's creators seem far less concerned with linear exactitude than many of their scavenging viewers, and then consider the anachronisms and black-and-white nature of those flash-forwards.) Last we saw of Gene in Season 3's premiere, he was lying in a heap on that Cinnabon floor after allowing the slightest glimpse of his old persona to surface. Better Call Saul returns to AMC Monday, August 6 at 9pm EST. Kenny Herzog is a journalist for outlets including Vulture, Mic and this one. He used to be an editor at places. Now he's not. You can find him on Twitter @kennyherzog.